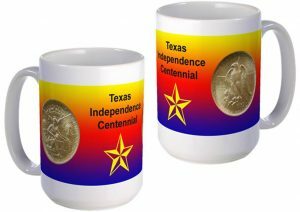 Today, the Texas Centennial Commemorative Silver Half Dollar Coin remembers the first day of the convention where their declaration of independence began on March 1, 1836. For the fourth time in our history, a convention of all Texas met on March 1, 1836, at Washington on the Brazos. Without a moment’s delay, a permanent organization was had with Richard Ellis, from Red River, as Chairman. The General Council was still in session at San Felipe, but its conspicuous failures earned it the contempt of the new convention. An effort was made to have the convention go into merits of the quarrel between Governor Smith and the Council, but the convention hurried to the tasks before it and declined to take any notice of the controversy, and the whole pitiful farce passed into history. It is fair to Governor Smith to say that that generation exonerated his fidelity and integrity, but probably not his judgment. As soon as the convention was ready for business, George C. Childress, of the Red River country, moved the appointment of a committee of five to draft a declaration of independence. Tradition tells that he had already prepared the draft of the declaration and that it had been approved by Houston and others to whom it had been submitted. The committee brought in the draft the next morning, and when it was read on motion of General Houston, it was unanimously adopted early in the morning of March 2, 1836, which by the way was his 43rd birthday. Yesterday was a warm day, and at bed time I found it necessary to throw off some clothes. In the night the wind sprung up from the north and blew a gale, accompanied by lightning, thunder, rain and hail, and it became very cold. In the morning the thermometer was down to 33 degrees, and everybody shivering and exclaiming against the cold. This is the second regular norther that I have experienced. Notwithstanding the cold, the members of the Convention, to the number of —, met today in an unfinished house, without doors or windows. In lieu of glass, cotton cloth was stretched across the windows, which partially excluded the cold wind. The Convention was called to order by Mr. Childers, of Milam. Mr. Collingsworth, of Brazoria, was called to the chair pro tem., and Mr. Farris appointed Secretary pro tem. A committee on elections was then appointed, to whom the credentials of members were to be submitted, and the Convention adjourned until half past 1 o’clock. At half past 1 the Convention met, and the committee reported forty-one members present who were duly elected, and some about which there was contest or difficulty, on which they wished the action of the house. Members-Elect of the New Convention. Nacogdoches—Thomas J. Rusk, Ga.; Jno. S. Roberts, C. S. Taylor, England; R. Potter, North Carolina. San Augustine—Martin Parmer, E. O. Legrand, S. B. Blount, South Carolina. Sabine—James Gaines, Va.; William Clark. Washington—Dr. B. B. Goodrich, Virginia, via Tennessee and Alabama; Capt. G. B. Swisher, Tennessee; Dr. S. Barnett, Tennessee; Jesse Grymes. San Felipe—Dr. C. B. Stewart, Thomas Barnett, Randall Jones. Milam–Geo. C. Childers, Tennessee; S. C. Robertson, Tennessee. Columbia—Edwin Waller, Virginia; J. S. D. Byron, James Collingsworth, Tennessee; Asa Brigham. Matagorda—Bailey Hardeman, S. Rhoades Fisher. Mina—Rob. M. Coleman, Dr. Thos. J. Gazley, J. W. Bunton. Goliad or La Bahia–Dr. Wm. Motley, Virginia, via Kentucky; Incarnation Bascus, Mexico. Jefferson—Claiborne West, Wm. B. Scates. Colorado—Wm. Menifee, Tenn.; W. D. Lacy. Harrisburg—Lorenzo de Zavala, A. Briscoe. Liberty—M. B. Menard, A. B. Hardin. Refugio—Gen’l S. Houston, James Powers, by citizens; Edw’d Conrad, Penn. ; David Thomas, by Volunteers. Jasper—S. H. Everett, G. W. Smith. Shelby—S. O. Pennington, Wm. C. Crawford. Pecan Point—Rob. Hamilton, Rich’d Ellis, Collin McKenna, Albert H. Latimer, Sam’l P. Carson. The house was then organized by the appointment of Judge Richard Ellis, President, and Herbert S. Kimble, Secretary. On motion of Mr. Geo. C. Childers, a committee consisting of Childers, Colin McKenna, Edward Conrad, Jas. Gaines and Bailey Hardeman was appointed to prepare and report a declaration of independence, with directions to report as speedily as practicable. A motion was then made to wait on Governor H. Smith and inform him that the Convention is organized, and ready to receive any communication he may have to make. This led to a discussion in which some excitement was manifested. The quarrel between the Governor and Council was spoken of in unmeasured terms of reprobation. It was finally amended so as to include the Governor, Lieutenant Governor and Council, in order, as was avowed by members in debate, to take no cognizance of the private quarrels or private griefs of either party, but to call on each for whatever official information concerning the common weal they may have to communicate. The house then adjourned until tomorrow morning at 9 o’clock. 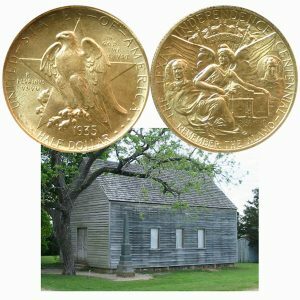 The Texas Centennial Commemorative Silver Half Dollar Coin shows with the image of a replica of the building where the convention met March 1-17, 1836 at Washington-on-the-Brazos.